Convolution is used in signal processing and analysis. We can use convolution to construct the output of system for any arbitrary input signal, if we know the impulse response of system. In order to understand the meaning of convolution, we have to take a look on impulse response and impulse decomposition. The input signal is decomposed into simple additive components (in general, weighted sum of basis signals). And the system response of the input signal is the additive output of these components passed through the system. We often use impulse (delta) functions for the basis signals. $\delta [n-1]$ is 1 at n=1 and zeros at others. $x[n]$ can be represented by adding 3 shifted and scaled impulse functions. It is the output of a system resulting from an impulse input. It means a signal is decomposed into a set of impulses and the output signal can be computed by adding the scaled and shifted impulse responses. Convolution works on the linear and time invariant system. 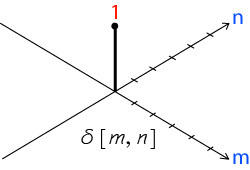 If you face the boundary such as x[-1],x[-2] you can skip the convolution at the boundary or pad 0 to them. 2D convolution is extension of 1D convolution. It convolves both horizontal and vertical directions. It is used in image processing. Here, the matrix uses [column, row] form. A signal can be decomposed into a sum of scaled and shifted impulse functions. Figure: a 3x3 matrix with indices -1,0,1, with origin is at middle of kernel.